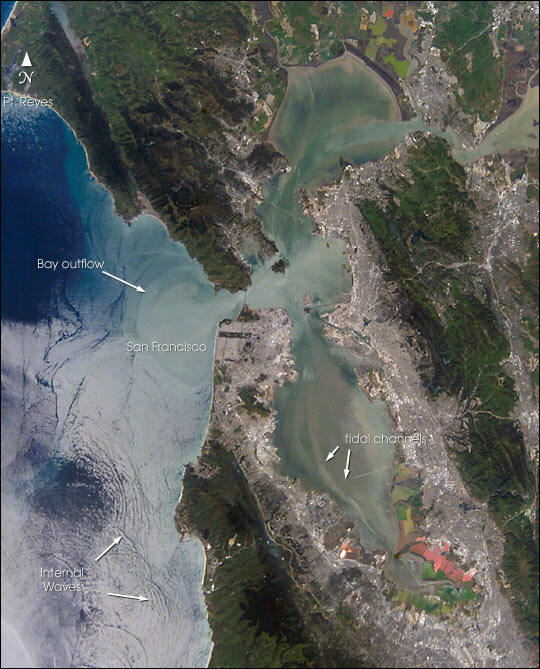 Astronauts aboard the International Space Station (ISS) recently photographed the San Francisco Bay area. The gray urban footprint of San Francisco, Oakland, San Jose, and their surrounding suburbs contrast strongly with the green hillsides. Of particular note are the Pacific Ocean water patterns that are highlighted in the sun glint. Sets of internal waves traveling east impinge on the coastline south of San Francisco. At the same time, fresher bay water flows out from the bay beneath the Golden Gate Bridge, creating a large plume traveling westward. Tidal current channels suggest the tidal flow deep in the bay. Because the ISS orbits are not synchronous with the sun, astronauts view the Earth with variable solar illumination angles. This allows them to document phenomena such as the sun reflecting differentially off surface waters in a way that outlines complicated water structures. Image ISS004-E-10288, was taken using a digital camera from the International Space Station and was provided by the Earth Sciences and Image Analysis Laboratory at Johnson Space Center. Additional images taken by astronauts and cosmonauts can be viewed at the NASA-JSC Gateway to Astronaut Photography of Earth. 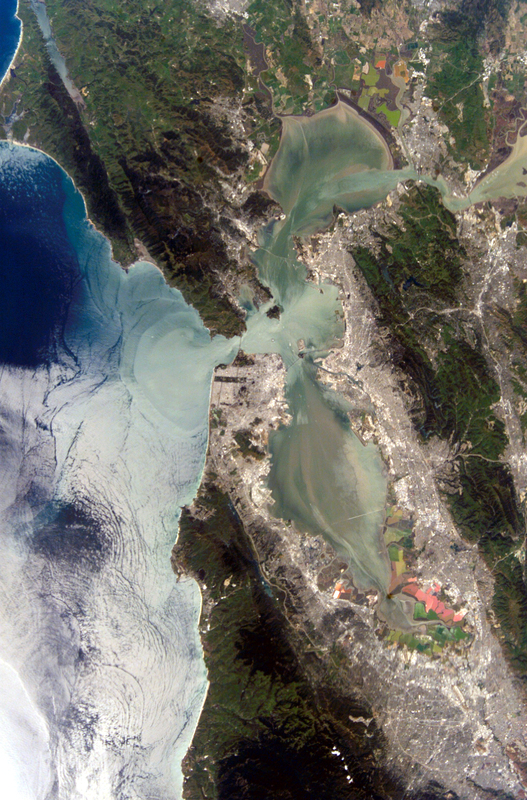 Astronauts aboard the International Space Station (ISS) took this photograph of the San Francisco Bay area in April, 2002. The gray urban footprint of San Francisco, Oakland, San Jose, and their surrounding suburbs contrast strongly with the green hillsides. Of particular note are the Pacific Ocean water patterns that are highlighted in the sun glint. Sets of internal waves traveling east impinge on the coastline south of San Francisco. At the same time, fresher bay water flows out from the bay beneath the Golden Gate Bridge, creating a large plume traveling westward. Tidal current channels suggest the tidal flow deep in thebay. Because the ISS orbits are not synchronous with the sun, astronauts view the Earth with variable solar illumination angles. This allows them to document phenomena such as the sun reflecting differentially off surface waters in a way that outlines complicated water structures.